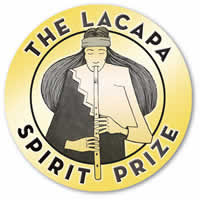 While reading Debbie Reese's illuminating American Indians in Children's Literature blog, I learned that the LaCapa Children's Book Awards is now accepting submissions. Named for Michael Lacapa, children’s book illustrator and writer who died in 2005, the award honors the legacy of his artistic vision and talent for storytelling. This prize acknowledges great books for children that best embody the spirit of the peoples, culture, and natural landscape of the Southwest. Books published in the two years prior to the award are eligible for consideration. Submissions for the 2008 prize are due December 10, 2007 and winners will be announced in January.